Experience the wonderful calls of many of the birds of the subtropical eastern part of Australia which includes Brisbane and Sydney. This region is bounded by Rockhampton to the north, Nowra to the south and includes the Great Dividing Range. This CD presents a range of calls for birds known for their amazing vocal abilities as well as those that are known only to this region, or are difficult to observe. 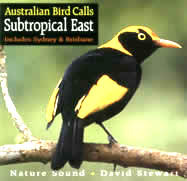 Species with distinctive calls include Glossy Black-Cockatoo, Channel-billed Cuckoo, Sooty Owl, Marbled Frogmouth, Laughing Kookaburra, Albert's and Superb Lyrebirds, Rufous Scrub-bird, Eastern Whipbird and Satin Bowerbird. Other more difficult to see species include Black-breasted Button-quail, Rose-crowned Fruit-Dove, Grass Owl, Noisy Pitta, Eastern Bristlebird, Rockwarbler, Regent Honeyeater, White-eared Monarch and Russet-tailed Thrush. Where possible, a variety of calls of each species are presented. This makes the listener aware of the repertoire of sounds many of the birds possess, particularly songbirds. This album has no music or spoken commentary. The natural calls of the birds of this region can be appreciated both as a source of pleasant sounds, or as a well documented reference source of many of the subtropical east bird species, particularly those that are difficult to observe. A list of the species, with call description and behaviour notes, can be found inside the cover. For those people with a particular interest in any of the calls, further information can be obtained from the author. This CD contains calls of 83 species. 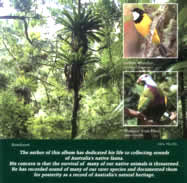 Birds Australia, the largest bird organisation in the country, endorses and recommends this CD to anybody interested in enjoying and knowing the calls of many of Australia's wonderful birds found in this region. Total length: 73 minutes 56 seconds.